You might begin to think your relationship is one sided when you start to notice hints and traits from your partner such as differences in communication, body language and actions. It can be very hurtful and painful to realise you're in a one-sided relationship, especially when it feels like you're making all the effort. It can be painful to face the truth that your other half simply isn't trying anymore. Sometimes your boyfriend/girlfriend may simply be busy with work or college and they simply just don't have the time to put in as much effort as they used to, however, it can be the case that they've stopped caring as much and the relationship has become one-sided. These are the signs to tell if your relationship has become one sided. If you're waiting days to hear from your significant other, it's a clear sign they're losing interest in the relationship and have other priorities on their mind. If your girlfriend or boyfriend never texts you or rarely replies to your messages, they're not concerned with keeping in contact with you and it's clearly not that important to them. If you're not the one making the effort, then you go days without hearing from them. Also, if they reply with one word answers or only a few sentences in each conversation, they've stopped making an effort to speak to you and it's clear that you're the only one making the effort in the relationship. You've sent them texts and messages and they haven't responded or they've replied with very little conversation. You want to keep the conversation going but if you message them again you feel like it's only going to annoy them. You shouldn't feel like you're annoying your partner by wanting to have a conversation with them. You try not to contact them for a while out of not wanting to be annoying. You should feel at ease speaking to your partner about anything and you shouldn't feel unable to contact them without it being an issue. If you're the only one making plans and organising things, it's a major sign you're in a one sided relationship. If the other person doesn't get excited about seeing you and making plans to meet up and do things, then the relationship isn't working out. You should both be equally excited about seeing each other and both people in the relationship should make an effort to make plans to meet up and hang out or go on dates. If they put everything in their life before you, including work, friends, social life etc. then they're not making an effort to make you a priority in their life. Everyone has to work and make a living but if they choose to work overtime and put their income before you at all times, then it's not fair on you emotionally. They prefer to hang out with their friends, leaving you wondering where they are and what they're doing and why they're not with you. 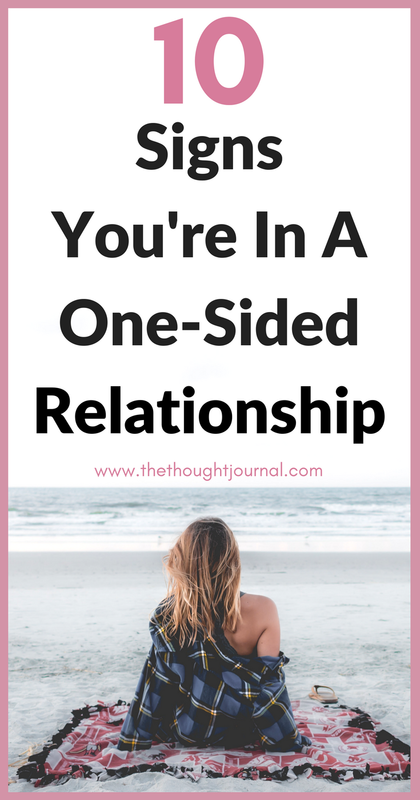 If they like to hang out with friends and go out drinking all of them time instead of spending any time with you, you're definitely in a one-sided relationship and you should reassess your situation asap. If you're constantly worrying and anxious about your relationship due to it being one-sided, then you need to talk to your partner about it and think about whether you'd be better off out of this relationship. It's constantly on your mind that the relationship isn't working, that they're being distant and whether maybe you should break up. A relationship should be full of happy thoughts and excitement, not worry and emotional stress. If your relationship is making you extremely stressed and upset, then they're not the one for you. If the relationship has become one-sided it could mean that they've completely stopped caring about you, which is very painful to realise but if that is the case then you should have a conversation about it and ask them if they're really willing to make this relationship work. They don't care about your happiness or making you feel loved in your relationship. You deserve to be in a relationship with someone who cares so much about you, not someone who can't be bothered texting or calling because they don't care much about you anymore. If she or he's stopped caring, ask yourself if they're really worth caring about too. If they don't make plans, don't make an effort with you and don't bother contacting you, they might assume you're going to stick around and put up with it. They think they can get away with not putting effort into the relationship and that's why it's so important to communicate your concerns and let them know that you're not going to wait around for them to contact you when they feel like it. They treat you more like a friend or a mate who will put up with their crap. If your boyfriend or girlfriend takes you for granted, tell them exactly how you feel and that they need to make more of an effort with you or risk losing you. Instead of wanting to spend time with you, it feels like they only spend time with you because they have to and they're obligated to, just to keep you happy. Both partners in a relationship should be enthusiastic and excited about being with each other. One person shouldn't feel like it's a chore to spend time with the other, you should be a priority and not an obligation. They don't ask questions about your life and what you're doing or working on. They're not interested in important aspects of your life including work, family and friends. They don't really know about anything that's going on in your life. You ask them about things that are happening in their life and show an interest, but they rarely ever do the same. This can mean you're not important enough for them to care about the small or big things in your life and a clear sign that your relationship is one sided. Your other half should take interest in your day to day life and and be interested in everything you do. You don't feel like you can call them when you've had a bad day or you're feeling down. You feel like they're not approachable and you can't share your problems with them due to the fear of it being an annoyance to them or that they won't be interested in helping you. You feel like your problems would be a burden to them and you end up keeping them to yourself. If you don't feel comfortable telling your partner things, this will lead to you feeling unsupported and lonely in the relationship. You go out of your way to keep them happy, but they don't do the same for you. These are so apt, especially the one about them not taking the time to reply to you!